Does this violate any copyright/trademark laws? 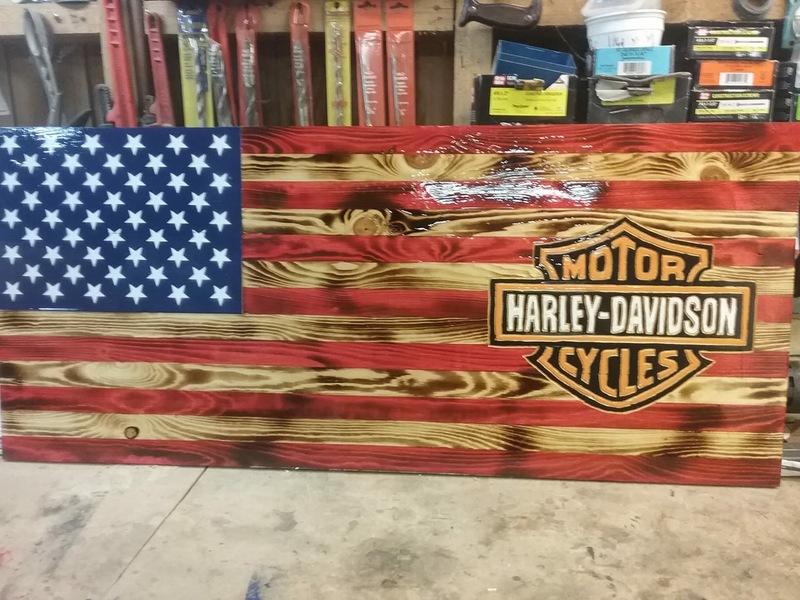 I found this guy on Facebook selling these flags with all different logos or companys and organizations on them. He says aince the logo is hand carved and not able to be mads produced, it doesnt violate any laws. Is this true? Why wouldnit being hand carved keep you from any prosecution? Harley could buy it off of FB, and your nailed. It was sold to them. They have lawyers do this all the time. There is no other item or name that is Harley -Davidson. It does not have to be perfect, that is their name and logo. It is pretty easy to see all of their logos being sold online. They know what is theirs. There is a little tool called Google reverse image search.